Blouse: Topshop. 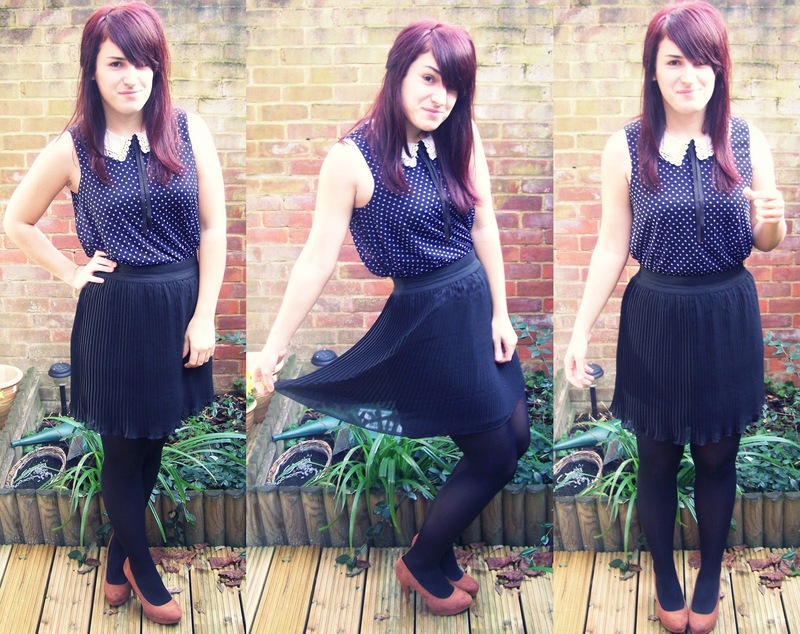 Skirt: Matalan. Heels: New Look. Since spending my many spare hours in bed, I don't actually feel like I have a lot too say..?! Is that worrying? Because I know I am Miss talkalotaboutshitalot. I am the queen of that! ALTHOUGH, this week I actually got time to see littlebum. That was really strange! We normally pass in the night. he gets up whilst I am asleep. He comes home, when I am back asleep. And everyone thought we had the perfect relationship?! It's a tricky one. It really is. Some would see it as a bonus that they don't see their partners much. Others would disagree thinking it impossible to work! I don't think it's impossible, more, it makes me sad that I don't see him. You see, I met littlebum in the French Alps (fancy you say? It totally wasn't!) and I wasn't actually interested in him. But obviously, life gets in the way and blah blah blah! So we got used to being around each other all day, everyday, and thankfully upon arriving back in the UK we only lived an hour apart.. BUT with weekends it wasn't really an exciting time for us. I would go and visit him, which would involve a lot of American trash TV, lots of sleeping and lack of food. All whilst he worked. All day. And night.Which is what made us decide to live together so early on in our relationship! (He wanted me so bad! JOKES) Obviously I see him a LOT more than I would have done, if we'd have lived at home, but everyone laughs when I tell them I don't see him! He has a stupid job anyway! I really don't know why I just wrote about him.. I'm sure he'll love that though (I bet he's reading it on his ipood - Still jealous!) But sadness aside, we actually get a FULL weekend together! Literally! It's going to be strange!